Liverpool manager Jurgen Klopp insists Jordan Henderson was substituted during the 1-0 win at Huddersfield Town as a precautionary measure. The former Sunderland midfielder picked up a knock in the first half against the Terriers but should be back in action in midweek when Klopp's team take on Red Star Belgrade in the Champions League. Liverpool were a little fortunate to win in West Yorkshire, with Mo Salah scoring the only goal of the match. David Wagner's team went close to grabbing an equaliser but remain without a Premier League victory this season and are 1/10000 to be relegated while Liverpool can be backed at 3/1 to win the title. Former Borussia Dortmund coach Klopp said: "It is maybe the first period in my life when we win average matches. I have to say that sometimes I really prefer the spectacular way but I take that and completely understand why it was like that. "I look in the dressing room now or before the game, when you come back from the international break there is the time difference and many things people do not see. "That is why I was a bit more animated on the touchline, because even when you are tired you can be afraid of your manager." 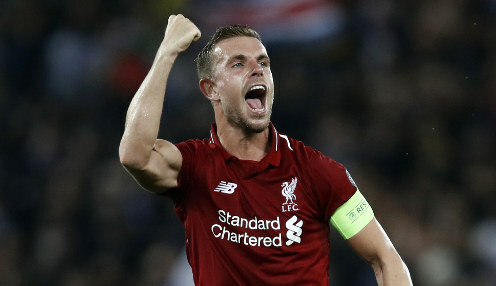 When asked about Henderson, Klopp added: "It was not that he felt nothing but he didn't feel a lot. He wanted to carry on - that's a good sign. We decided no. Hopefully it's nothing."